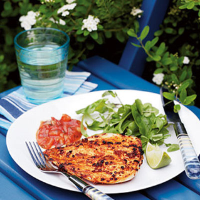 These thinly-cut spicy chicken breast fillets are full of flavour and brilliant for cooking quickly over the hottest part of the barbecue. Make sure your barbecue is really hot. Slice through the centre of each chicken breast horizontally but don’t quite cut them in half. Open the fillets out so they lie flat. Using a pestle and mortar, crush the coriander seeds roughly. Add the garlic cloves and lime zest, then pound to make a coarse paste. Add the lime juice and the paprika, then season and mix again until well blended. Rub the mixture into the chicken breasts and leave to marinate for 5 minutes. Cook the butterflied chicken breasts on the barbecue for 5-10 minutes on each side or until cooked through and lightly charred. Alternatively, cook under a grill, set to high. Serve with the salad and salsa. The marinade contains lime juice, which tenderizes the meat – but don’t leave it for more than the 5 minutes or the chicken may fall apart as you cook it.